The Bobcat Chronicle: All Sportsmanship Team! 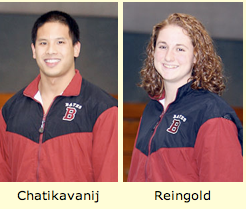 The NESCAC announced their All-Sportsmanship Team today, and Sarah Reingold and Peem Chatikavanij were selected! Congratulations! HADLEY, Mass. -- Six Bates students were named to the 2010 NESCAC Winter All-Sportsmanship Team, announced Tuesday by the New England Small College Athletic Conference. The All-Sportsmanship Team is comprised of one student athlete from each institution for each sport, and is selected by the players and coaches from their respective team for their positive contributions to sportsmanship. The student-athlete selected must be in good academic standing and a member of the team at the conclusion of the season in order to be eligible for selection. Two of Bates' awardees are making return appearances from the 2009 All-Sportsmanship Team: seniors Marshall Hatch(Chicago, Ill.) of the men's basketball team and Sarah Reingold (Oakland, Calif.) of the women's swimming and diving team. Men's Basketball: Marshall Hatch, Sr.; Chicago, Ill.
Women's Basketball: Annie Burns, So. ; Topsfield, Mass. Men's Squash: Eric Bedell, Fy. ; Brooklyn, N.Y.
Women's Squash: Mimi Neal, So. ; Danvers, Mass. Women's Swimming and Diving: Sarah Reingold, Sr.; Oakland, Calif. The All-Sportsmanship Team recognizes student-athletes from each varsity sport who have demonstrated outstanding dedication to sportsmanship. These student-athletes exhibit respect for themselves, teammates, coaches, opponents, and spectators. They display sportsmanship not only as a participant in their sport, but also as a spectator and in their everyday lives. Through their positive actions and example, these student athletes inspire others to adhere to the quality of sportsmanship that the NESCAC and the NCAA endorse.